Madagascar Pepper is considered the King of Spices as it’s the most widely used spices in the world. This hotly pungent spice is used as flavouring for savoury foods, meat dishes, sauces and snack foods. 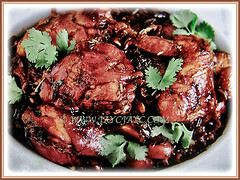 Besides, it is popularly used as a table condiment to enhance the flavour of dishes. 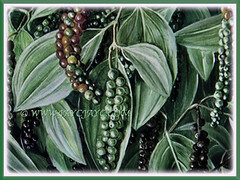 Common Names: Black Pepper, Common Pepper, Pepper Vine/Plant, White/Madagascar Pepper, Lada Hitam in Malay. Etymology: The genus Piper comes from the Latin name from the Greek word peperi, itself derived from an Indian name. The specific epithet nigrum means black. Origin:Native to south India, Malabar Coast, Malaysia and Java. It is widely cultivated around the world. An ornamental and perennial fruit-bearing vine. 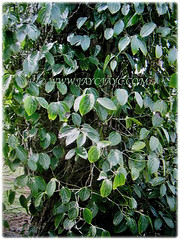 Features: Piper nigrum is from the genus Piper that comprises of about 2,000 species. 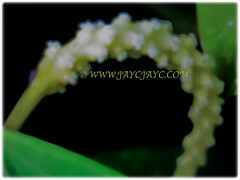 A woody climber that typically grows to a height or length of 3-4.6 m and as wide but may reach 10 m or more in its native habitat. Once the main stem is established, it grows many side shoots to create a bushy column. It forms adventitious roots which connect to surrounding supports. Evergreen leaves are typically egg-shaped, cordate, palmately-veined with entire margin, dark green and glossy above and paler green on the underside. 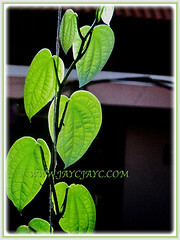 Leaves are 12-17 cm long and arranged alternately along the stout and flexible climbing stems. A free-flowering vine with tiny and unisexual flowers that are borne in clusters along the 11 cm long flowering spikes that grow outward from the joint of leaf stem. Apetalous florets are coloured yellowish-green. Eventually, the flowers will be followed by 3-5 mm wide berry-like drupes or fruits, green at first and turning red as they ripen. Unripened fruits turn black after about 3 days of drying. Each containing a single seed. 50-60 fruits are borne on each spike. When dried, the fruits are known as peppercorns. 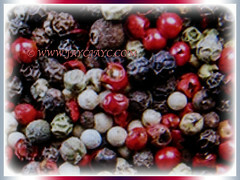 Peppercorns and the ground pepper derived from the fruits may be described simply as black pepper (cooked and dried unripe fruit), green pepper (dried unripe fruit) and white pepper (ripe fruit seeds). 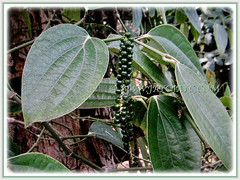 Culture (Care): Piper nigrum or Black Pepper can be grown easily with least maintenance. Light: Semi-shade, bright indirect sun or sun dappled location. Soil: Fertile, loamy, moist and well-drained soils. However, it can be grown on a wide range of soils and even tolerate dry soil. Others: Provide this beautiful vine with a support structure such as a wooden frame or prop tree for it the climb. Prune the stems to encourage branching. Once monthly, feed the vine with a balanced liquid fertiliser to stimulate growth and fruit production. Generally free from serious pests and diseases. However, watch out for aphids on indoor plants and it’s susceptible to root rot, pepper weevil and pepper flea beetle. For subtropical and temperate regions: Hardiness: USDA Zone 12. 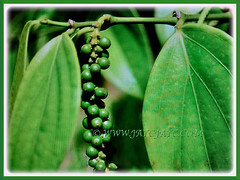 Piper nigrum or Black Pepper is a tropical vine that is best grown in tropical areas where typical temps range throughout the year from 12-32°C. It needs to be grown indoors as a houseplant in temperate regions. 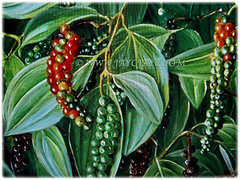 With patience it can produce peppercorns although plants need to be several years old before they fruit. Houseplants are intolerant of winter temperatures below 10°C. It is best grown in sun dappled areas or areas with bright indirect sun. Outside of tropical areas, it may be grown in conservatories or greenhouses. It may also be grown in containers as a houseplant with an attached trellis or in a hanging basket when young. Containers may be taken outside for the warm summer months and brought indoors to overwinter. Propagation: Easily propagated by seeds, tip of stem cuttings and stolon. Usage: Piper nigrum or Madagascar Pepper is widely cultivated, especially in tropical regions for its fruit which is usually dried and used as a spice and seasoning. 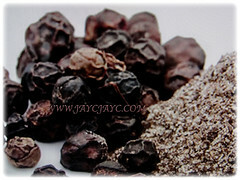 Its dried fruits known as peppercorns are used to make black pepper. This hotly pungent spice is used as flavouring for savoury foods, meat dishes, sauces and snack foods. It’s also used as a table condiment to enhance the flavour of dishes. Black pepper, white pepper and green peppercorns are all produced from fruits of Piper nigrum but are harvested at different times and are processed differently. Black pepper is also used to produce pepper oil and oleoresin which are frequently used in the production of convenience foods and sometimes also for perfumery. 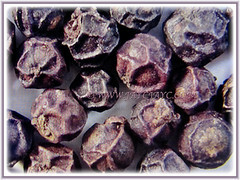 Black Pepper is reported to have anti-fungal and anti-oxidant properties. In many Asian countries, pepper is used in folk medicine to treat a variety of conditions, such as colic, rheumatism, headache, diarrhoea, dysentery, cholera, menstrual pains, excess gas, and urinary problems. Ideal to be grown in the ground or container. Suited for hanging baskets when plants are young.